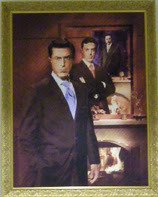 The Smithsonian National Portrait Gallery has finally recognized our greatest American Hero: Stephen Colbert. His unique "triple portrait" will be on display for only 6 weeks, so if you will be in the area check it out. The portrait can be found on the second floor near the presidents' hall. Proceed to the end of the hall and take a left in the doorway labeled "restroom". The portrait is located above the water fountain. Watch Stephen convince the director of the Smithsonian to display his portrait. haha If only I was going to Washington DC.